It really wasn’t that long ago - a time when the landscape looked so different - a time when the inhabitants practiced a way of life so different to what we do today. What was it like to live here back then? Where did the food come from? How were shelters made? ...What exactly happened here at this Bora Ring? These were my thoughts as I stood for the first time at our new landcare site - the ‘Lennox Head Aboriginal Area’, just off Gibbon Street. It’s a place that certainly arouses contemplation. A large circle of flat land, 32 metres in diameter, defined by a ring of raised earth. Once a place where boys of the Bundjalung people were initiated. We’ll be treading pretty carefully at our new landcare site, which we’ll begin working at this month. With guidance from National Parks and Wildlife Service staff, we’ll be carrying out weeding works in the vegetation surrounding the Bora Ring. Ceremonial Bora Grounds are normally comprised of a complex of two or three Bora Rings, linked by a path or paths. What exactly happened in each of these Bora Rings, appears to be the business of the indigenous men. We do know though, that back in the 1940's another two Bora Rings were still present in the Lennox village. One of these, a smaller ring is said to have been located on what is now the Megan Crescent sporting field. Prior to european presence in this area, which didn’t happen until the cedar cutters arrived in the 1840’s, tribes of the Bundjalung people lived a life rich in cultural practices. Food from the rainforests, wetlands and the sea was plentiful. An estimated 4-500 indigenous people lived in the Lennox Head area, and in excess of 5000 in the Bundjalung nation (which extended from the Clarence River at Iluka to the Logan River in SE QLD). The plight of indigenous people in the european settlement / invasion period, has for the most part gone unspoken in this region, as it has in many other parts of the country. Only in recent times has the truth been pieced together and recorded, opening our eyes to a dark history of decades of conflict and demise for the Bundjalung people... ‘Certainly from the 1840’s most of the region was affected by cycles of violence ranging from individual murders to large massacres and reprisals (Hoff, 2006)’. 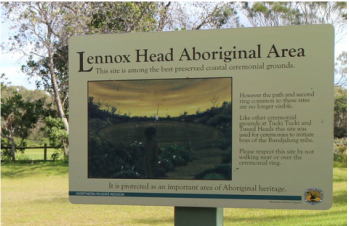 There’s a sense of loss, intrigue and respect that one can’t help but feel when visiting the ‘Lennox Head Aboriginal Area’. It’s an important area to continue to conserve, not only for the traditional owners of our land, but for all of us - as a space to reflect on those who paid the highest price for our presence here today.